Keeping gutter systems in the best state can be a challenging task. After gutters have been in place for an extended period, it is common for problems that are not easily notable to happen. The soffits and fascia that lie under the gutters may have experienced damage from rain, sun or wind. This is a common occurrence specifically for old houses. There is need for sufficient amount of expertise and knowledge to correct the issue appropriately. We at Midland Gutter Pros have over ten years of experience in repair of Fascia. Our team of professionals can remove and repair segments of your siding to ascertain your building regains its best state. 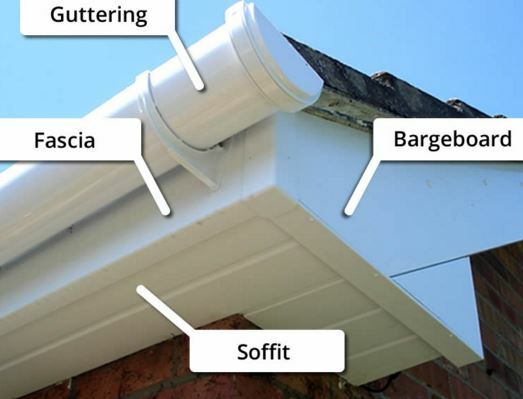 Fascia and soffits are part of a roof structure and are often close to the gutters. ​This means that they will be among the first items to be damaged by water if by any chance the gutters get clogged. Besides, it is common for them to fall victim to insect infestation, nesting of birds, as well as infestation by other animals. If you encounter peeling of paint and any discoloration, this can act as a huge sign that the soffits and fascia of your apartment have been damaged. If you have experiences in this sector or if you are a carpenter, you can probably perform a roof repair diy on the building. However, if you are not, you should seek services from us for professional services. House roof repair is often complicated when one has not carried it out before. Extreme weather damage regularly leads to the need for soffit and fascia repair. First, it is always essential to have an evaluation of the damage. One can consider carrying out visual inspection, but it may not indicate all that is needed to be done. An easy installation of a brand new gutter system may not solve the problem. Midland Gutter Pros serve customers in Midland, Michigan with all types of guttering and fascia repair or replacement. You will only be required to make a call or email to describe your worries to us to have an estimate of the cost that you will incur to your business or apartment. In most scenarios, it is common for the cost of repairing fascia to vary depending on the extent to which your structure is damaged. Upon our team of experts touring your home, you will be offered with a repair quote that possesses an entire explanation of the degree of the problem and what requires to be performed to solve the menace straightaway. The integrity of your apartment relies on the accuracy of the evaluation. If you are having issues with your present guttering system and you think that your house has sustained any damage to the soffits or fascia, seeking professional assistance from us may be the best option. Lastly, in addition to guttering and fascia replacement, roof fascia repair and soffit replacement, our company can also solve any issue that you may be having with your siding irrespective of whether it is wood shingles, aluminum, vinyl, composite and any other material. Now, if you need any of the above services, consider giving us a call.